by Brian L. Wixon, Director, Product Line Management, Infrastructure Products, Galtronics, Inc. The need for ubiquitous wireless coverage, along with gigabit speeds, is driving a new wave of wireless infrastructure deployments. Generically referred to as small cell, C-RAN (Cloud-Radio Access Network), or distributed node deployments, the common goal of these infrastructure deployments is to provide network improvements available in 4G Advanced and developing 5G standards such as network “breathing” (redeployment of radio assets where needed), reduced latency, faster data speeds, and applications slicing for IOT (Internet of Things) and Autonomous Vehicle requirements. For example, in 2016 there were approximately 6 billion devices connected to the Internet, and by the end of this year the number is expected to increase to a staggering 11 billion devices. An increasing number of those devices are connected via wireless connectivity, including smartphones and IOT connected devices. The primary method of enabling such enhancements is through network densification. Essentially, network densification is the deployment of radio access nodes closer to the mobile user, hence the descriptor “Small Cell.” Since small cell deployments are more closely spaced to one another, these types of sites or access points (APs) have a smaller coverage radius and therefore allow for lower radiated power service. At the same time as these new radio nodes are being installed, new radio and access technology advancements are being deployed today that would have been unthinkable or unavailable just a few years ago. Such advancements include multi-carrier/multi-band radios, carrier aggregation, use of unlicensed frequency bands for capacity offload or to augment data speeds, expansion of MIMO functionality from simple 1×2/2×2 arrays to 2×4/4×4 or 4×8/8×8, on-site or remote optimization of the antenna RF radiation pattern in both elevation and azimuth, or even beam shaping by 8×8 or more “massive” and beam selective MIMO antenna architectures. Each of these enhancements facilitates or aids one or more of the requirements of the 5G network. High gain directional panel antennas have long been used in the cellular infrastructure space for macro site applications. These antennas typically provide 33, 65 or 90 degree horizontal beamwidth (HBW), remote electronic tilt (RET) capability, and gains generally ranging from 12-19 dBi for 4, 6 and 8 foot panel heights, dependent upon array gain/vertical beam width (VBW), determined by panel height and number of array elements, and HBW. In general, the more concentrated the RF energy from the antenna in the elevation (VBW) plane, the taller the antenna becomes, and likewise, the narrower the antenna is in the HBW plane, the wider the antenna physically becomes for a given frequency. This larger physical size is necessary both to accommodate larger number of elements and also to decrease HBW for a given number of elements for a given frequency, both factors working to focus the RF energy within tighter vertical and horizontal beamwidths. Macro sites fundamentally differ from small cell/densification sites in that the key objective of a macro site is to provide a minimal level of coverage over a very wide area, often 1 mile or larger in diameter. As many users are connected to any given macro site sector, these users can be interspersed anywhere within the sector coverage range; some are near and under the main antenna boresight, some are far, meant to be in or near the antenna boresight. Hence, the macro sector is typically designed to provide a statistically acceptable user experience within the sector and edges under normal load conditions. Within the macro sector, the quality of radio link to (downlink) and from (uplink) the user can vary dramatically, depending upon distance from site, technology being utilized, antenna design (downtilt/gain/VBW/HBW), obstructions in the way such as foliage, buildings, etc., and last but definitely not least, the quantity of users utilizing the radio resources within a given sector. Therefore, the drive towards network densification is not by accident. It is based upon the need to place the radio resource closer (much closer in fact) to the user. This is not only to divide the native capacity for a given frequency/bandwidth/technology into smaller and smaller coverage radii for increased capacity for multiple types of users (human and non-human IOT connected devices), but also to enhance the user experience for faster data speeds and lower latency. In summary, higher data speeds, higher capacity and improved user experience have more or less become mutual requirements of the modern wireless infrastructure network. A larger quantity of radio nodes, each capable of optimized coverage over shorter distances to support expanding types of users and applications over multiple frequency bands, is required. Although macro panel antennas have many positive attributes and serve a deliberate purpose, they are overkill for the small cell application, in terms of gain (given small radio node coverage radius), physical size and cost. In terms of aesthetics, imagine multiple 4, 6 or 8’ panel antennas atop a lamp post or telephone pole in a city center? Or the added cost associated with deploying multiple macro antennas in a small cell application? One attribute of the macro panel antennas that can be carried over into the small cell space is multiple band coverage, each band accurate and sculpted as necessary for the given small cell site. There exists a need for an aesthetically apealing, cost effective, multiband antenna structure to be used for cellular network densification applications to achieve 5G network performance requirements. The choice of the small cell antenna provides the RF engineer an opportunity to optimize coverage (gain, HBW, VBW), band coverage, aesthetics and CAPEX and OPEX spend. Greater quantities of cell sites deployed in urban areas and elsewhere can allow for lower transmit (downlink to UE) powers to be utilized to prevent cross-cell carrier pollution, and in fact is a desired attribute as radio access nodes become more densely deployed and another reason why high (double digit) levels of antenna gain are not generally necessary. Given the fact that many densification sites are deployed with lower transmit (downlink) RF power often in the range of a few 100 milliwatts to <20 watts per carrier, the RF engineer can be tempted to consider the use of a simple dipole, or even iDAS omnidirectional antenna for deployment. Omnidirectional antennas have long served as the backbone for a variety of radio services from personal and commercial to government/military applications since the early days of radio communication, now well over 100 years ago and spanning three centuries. The first antennas designed by Henrich Hertz were dipole types, used for both transmitting and receiving, (reciprocity) placed at the focal point of a parabolic reflector (he published his work in Annalen der Physik und Chemie (vol. 36, 1889)). Advantages of the ¼ wave stub or dipole style omnidirectional antenna designs are simplicity, full omnidirectional coverage in azimuth orientation and low cost. As a simple structure, the omnidirectional dipole antenna provides for low cost in a small size which is attractive from the CAPEX and OPEX perspectives, but also has the additional benefit of minimal impact/degradation to site aesthetics when simply connected up to the RF ports of a radio. Despite the “first glance” benefits of these antennas, there exists a need for RAN optimization beyond the capabilities of the simple omnidirectional antenna. These include optimization per band (downtilt, gain, VBW, HBW) to satisfy the needs of new, modern multiband radios, and multi-band MIMO support (2×2 or 4×4, 8×8 or even beyond). Enter the Pseudo-Omni antenna. The Pseudo-Omni antenna utilizes the best attributes of the macro panel antenna (wideband, multi-band MIMO coverage, polarization diversity), while providing 360° horizontal coverage. An example of a 10-port Pseudo-Omni antenna is shown in Figure 1. Also referred to as a “Quasi-Omni” antenna, the Pseudo-Omni antenna integrates multiple panels and elements, oriented in a 360° pattern along with internally integrated combiners to feed transmit RF to, and derive receive RF signals from, individual antenna elements, so that common antenna ports can service a complete 360° azimuth pattern surrounding the antenna. Antenna elements are optimized within multiple bands so that gain, downtilt and vertical (elevation) and horizontal (azimuth) beamwidths are all optimized to meet specific customer requirements. 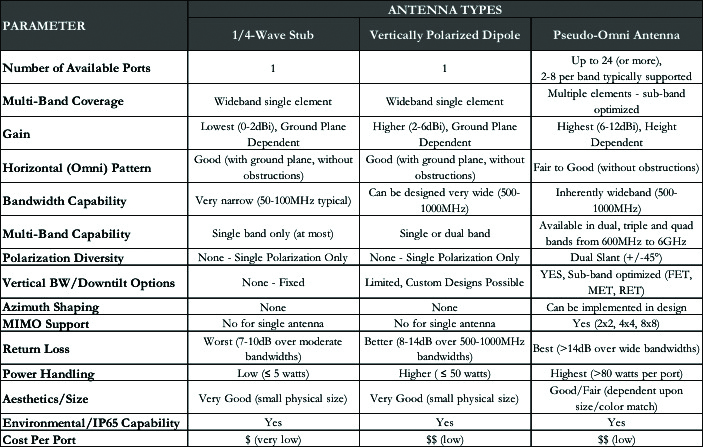 Figure 2 is a comparison of key performance attributes between ¼-wave, vertically polarized and pseudo omnidirectional antennas, with detail of each attribute following. Number of Available Ports: The Pseudo-Omni antenna is a multiple element array, so in a sense it is unfair to compare single port omnidirectional antennas against the Pseudo-Omni, however, the point being made here is that even if multiple ¼-wave or dipole omni antennas were to be deployed, there would exist no polarization diversity, no practical ability to set or control downtilt, limited bandwidth and other limitations the Pseudo-Omni overcomes. Multi-Band Coverage: Both ¼-wave stub and dipole designs provide for a limited number of bands that can be supported within the 600-6000MHz frequency range. The Pseudo-Omni antenna, in contrast, can support multiple bands through advanced designs that minimize physical dimensions of height and diameter in a single, integrated, carrier aggregation-ready assembly. You can think of the the Pseudo-Omni antenna as an antenna “hotel,” allowing multiple radios to service the node, thus enabling advanced IOT and 5G services. Gain: As stated previously, densification requirements in general require moderate (7-10 dBi) levels of gain. Simple omnidirectional designs cannot approach such gain levels, and are limited in gain to 0-5 dBi generally by definition. Horizontal (Omni) Pattern: The ¼-wave and dipole omni antenna performance in the category can be quite good, assuming necessary reference ground plane is provided. The Pseudo-Omni antenna in contrast is comprised of multiple panels which if not designed correctly can lead to excessive azimuth ripple, or even deep nulls (see Figure 3). See the “Variations of the Pseudo-Omni Antenna” section for additional information. Bandwidth Capability: The Pseudo-Omni antenna possesses the same attributes as the wideband dipole antenna element and can be tuned over quite wide bandwidths, 1695-2690 MHz for example. The ¼-wave stub antenna has the worst performance in this category. Multi-Band Capability: As the Pseudo-Omni antenna is comprised of multiple antenna elements in a single space, it can easily support 2 or more frequency bands, basically providing a “one stop RF coverage shop” opportunity for lowband 600 MHz through 6 GHz. Polarization Diversity: Single port omnidirectional antennas can only provide polarization in one axis (typically vertical), while Pseudo-Omni antennas provide cross polar (dual slant +/-45°) polarization, so each set of 2×2 radio feeds benefits from polarization diversity, and hence diversity gain. This is maintained over all bands supported by the Pseudo-Omni antenna. Vertical Beamwidth & Downtilt Options: As the elements within the Pseudo-Omni antenna are fed with a phase shifter, there is a fundamental ability to provide fixed (FET) downtilt options or even mechanical (MET) or electronic (RET) adjustability. These possibilities are either more difficult or not possible to implement with stub monopole or generic dipole approaches. Azimuth Shaping: In an increasing number of deployment scenarios, it is desirable to contour the omnidirectional pattern coverage to something other than a 360° omnidirectional shape. Examples are single beam, dual beam (peanut, heart) or even triple beam (clover) azimuth patterns. These patterns allow antenna placement and patterns to be optimized based upon manmade structure location and/or the RF environment the antenna is to be placed into, with a more pleasing aesthetic impact than panel antennas can provide. Supports MIMO: The Pseudo-Omni antenna provides a minimum of 2-branch MIMO and polarization diversity per band, with 4 and even 8-branch options available; the Pseudo-Omni antenna, again, provides a clear advantage the simple, low cost omni antennas cannot. Return Loss: Return loss is a simple measurement of the quality of the impedance match between antenna and the radio or other feed system components. Pseudo-Omni antennas are optimized for superior return loss over very wide bandwidths, 617-960 MHz, 1695-2690 MHz, 3400-3800 MHz and 5150-5925 MHz or part of each sub-band depending on application. Power Handling: As you might expect, being a derivative of macro cellular antenna panels with very high RF power handling capability, the Pseudo-Omni antenna structure also can handle similar high levels of power; however, specifying RF power handling for a Pseudo-Omni antenna is more than simply calculating the breakdown voltage of critical internal elements/structures and backing off by a comfortable safety factor. Heat dissipation sources need to be factored into the RF power rating specification. 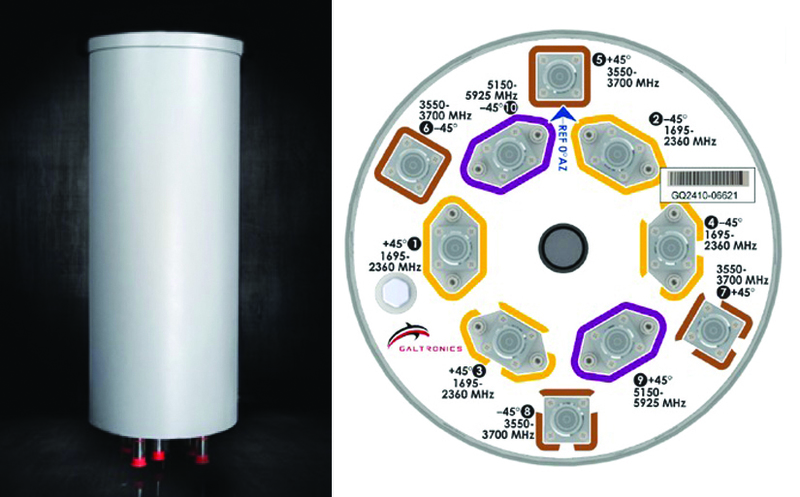 Galtronics has thermally tested our Pseudo-Omni antennas to pass rated power for extended duration. Aesthetics/Size: The simple stub and dipole designs can provide the user with very small, compact omnidirectional antenna package sizes, which aid in site aesthetics. Consider, however, multiple stub or dipole antennas connected directly to radios, performance of all compromised by mutual proximity as installed on the radio, lack of a common ground plane compromising antenna performance, but finally also requiring all radios for each band being placed at same physical location of the desired site radiating location, often 30-50 feet above ground level. The net result is severely compromised RF coverage and a new set of aesthetic issues. Modern Pseudo-Omni antennas utilize radome material that can be readily painted, either at the factory by the supplier, or in the field by the customer, to blend in with nearby surroundings. Galtronics offers a wide selection of color/concealment options for most Pseudo-Omni antennas; see Figure 4. Further color customization is available for high volume deployments. IP65 Capability: Traditional high gain multi-band macro panel antennas in the 4’ to 8’ range have historically employed drain holes at the bottom of the antenna to allow internal condensation a place to exit the antenna. This traditional approach works well when installation is 100-200 feet (or more) above ground level, and has been successfully used for decades in the wireless industry for panel antennas generally 4’-8’ in height. Issues with this approach arise, however, when the antenna structure is compressed into increasingly smaller and smaller sized assemblies. Most macro panel antennas are rated to only IP24, which prevents an object >12.5mm in size from passing through the drain hole and allows for “splashing” water applied to the antenna. Obviously a drain hole in the 10-12mm size range can, and does, allow ingress of small flying or crawling insects, and other environmental contaminants such as dust and ash, more common closer to ground level. IP65 compliance (water jets are directed at the antenna during a 3 minute test period, through a 6.3mm nozzle at a rate of 12.5L per minute and pressure of 30kPa at distance of 3 meters) is much more stringent with respect to moisture and environmental ingress, and is important for outdoor small cell antennas, as antenna performance can be much more adversely impacted in smaller sized antennas, such as Pseudo-Omni antennas in the 1’ to 4’ range. Galtronics’ latest generation Pseudo-Omni antennas are all IP65 capable. Cost: As they are simple structures, you would be correct in assuming the single port ¼-wave stub and dipole antennas are less costly than the Pseudo-Omni antenna structure. The Pseudo-Omni antenna assembly contains many more physical antenna elements and is larger physically than the simple single port omni antennas. Essentially, integrating multiple omnidirectional antennas over multiple frequency bands, polarization diversity and other advantages explained above, the value of the Pseudo-Omni antenna in small cell/densification extends beyond a simple expansion of number of physical ports. It is sometimes required to deviate from a full 360° omnidirectional coverage pattern, in what would otherwise (externally) appear to be an omnidirectional antenna. Since the native structure of the Pseudo-Omni antenna is comprised of multiple antenna panels and elements combined together, these elements can be deleted or manipulated to offer beam shaped Pseudo-Omni antennas that direct more radiational energy in one, or several azimuth orientations. As the outward physical appearance and dimensions of the antenna are the same or similar, the operator can deploy these customized omni antennas in the same city/jurisdiction as full 360° model Pseudo-Omni antennas. Only the operator needs to know the coverage differences! Such “sculpting” of the azimuth pattern allows the carrier to direct RF gain where needed, and less RF energy where not. 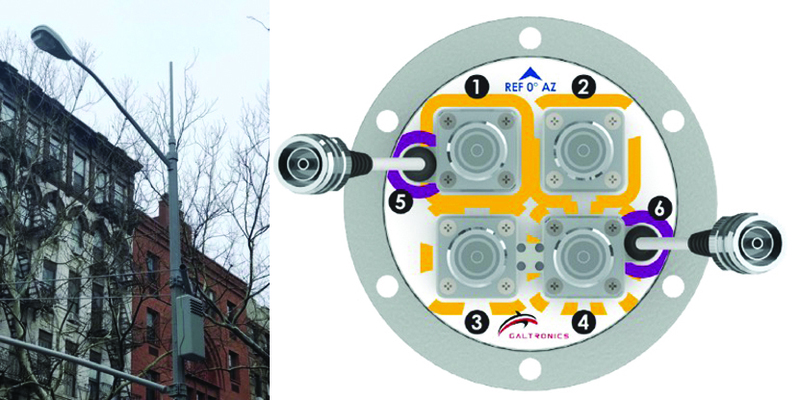 Galtronics offers single, dual (peanut and heart shaped) and triple (clover) beam Pseudo-Omni antennas for such contigencies. This includes our smallest Pseudo-Omni 6-port “Whip” antenna, model GO4806-06664. While the 6664 offers 360° horizontal (omni) coverage, variants are now being deployed with sculpted azimuth coverage patterns. 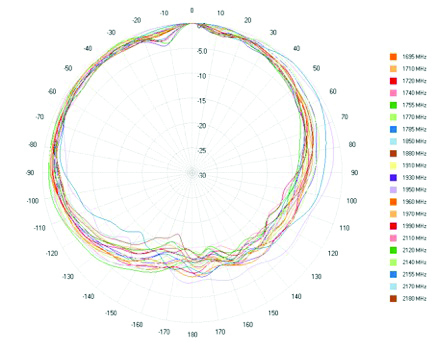 Figure 5 shows midband pattern sculpting of a 2” whip antenna representing 150° 3dB horizontal beamwidth, while Figure 6 shows typical urban installation of the GO4806-06664 and bottom side port access and configuration. The need for application and advantages of the Pseudo-Omni antenna have been examined in this article. While physical size and cost of the Pseudo-Omni antenna are greater than simple omni antenna structures, the wide range of benefits, such as multiband capability/consolidation, polarization diversity, MIMO support, horizontal and vertical pattern control, and optimization amongst others, provide the carrier with clear advantages that provide the user with a superior access and data throughput experience.